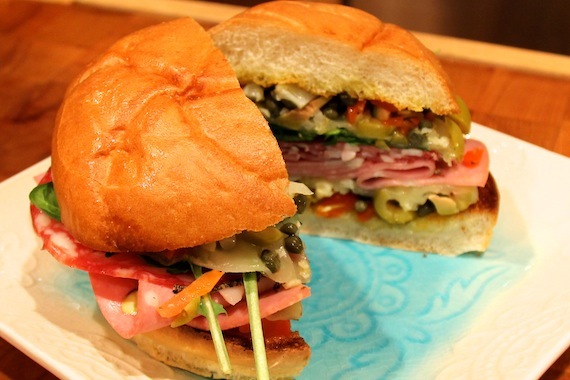 The muffuletta is the official New Orleans sandwich, at least it is in my opinion. Italian immigrants are rumored to have established the sandwich at the Central Grocery long ago, where it remains popular to this day. Sure, there are other ‘Nawlins sandwiches such as the “po’ boy”, which is a mighty fine sandwich in its own right, but I like the briny olivey goodness of the olive spread and the Italian cold cuts. This sandwich is reasonably easy to pull together with straightforward ingredients which are likely lurking about in your pantry and ice box. Also, the olive spread can be assembled well in advance and actually tastes better the longer it marinates about. While the recipe below specifies certain cheeses and meats, you will soon see that the olive spread plays well with an assortment of your favorite meats and cheese available at your local deli. Also, the bread is traditionally a large (frisbee size) disk of medium density bread. This is not always available, so you may have to improvise with a nice french roll or loaf in lieu of the frisbee. Don’t worry, it will be delicious! In a small bowl, combine the olives, giardiniera, capers, garlic, herbs de provence, and olive oil. Let marinate for 20 minutes. Assemble the sandwiches by slicing the bread and spreading the olive mixture on each side. Place some cheese slices over the olive mixture on each slice. Put the sandwich halves under the broiler briefly to melt the cheese and warm and crispify the edges of the bread. Next layer the cold cuts to your liking. I also like to add a few salad greens to mine. Enjoy!